Complete nutritional supplement rich in vitamins and minerals. 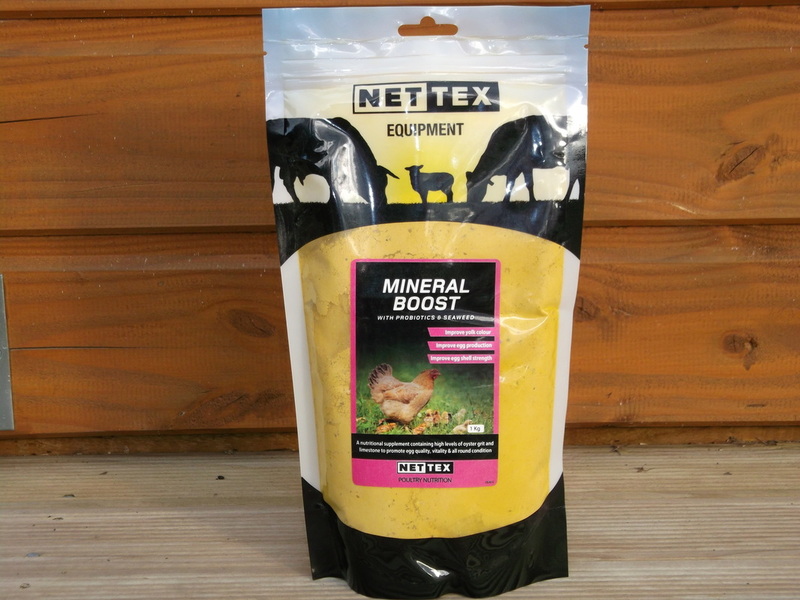 Nettex Mineral Boost is a complete nutritional supplement for all poultry, which result in faster moults, good egg quality and healthier, stronger birds. This nutritionally advanced mineral supplement contains high levels of limestone and oyster shell grit to increase calcium consumption and form strong eggshells. Seaweed, which is rich in vitamins and minerals, including iodine, increases and improves the quality of egg shell strength, improves yolk colour and laying performance. It also improves feed conversion and absorption of nutrients. Phosphorous, to help the birds metabolise calcium. Probiotics that contain live beneficial bacteria, help stimulate the immune system thus reducing the Salmonella bacteria in the gut by up to 99 per cent. Also protects against Sour Crop. B Vitamins that stimulate the immune system to improve all round condition and performance. This is a supplement we wouldn't be without and give constantly to our flock. We see the results in our healthy birds every day. We recommend adding one heaped teaspoon of Mineral Boost to a 10 litre bucket of pellets.